Overlooking the entrance to San Juan Bay, in Old San Juan, Puerto Rico, stands the iconic fortification of Castillo San Felipe del Morro. Starting in the late 1530s, it took 250 years to complete construction of El Morro, which now greets cruise ships as they sail into the bay. El Morro, along with Fort San Juan de la Cruz on the western side of the bay, Castillo San Cristóbal, and the surrounding city walls, stands as a testament to the engineering and craftsmanship that made San Juan one of the best-protected Caribbean ports in the 18th century. 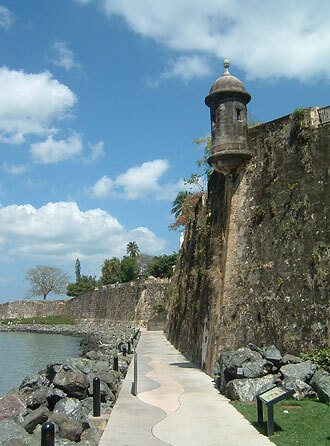 The fortifications protected Puerto Rico, then a Spanish colony, from Spain's enemies—notably England, Holland and France—until the Spanish-American War in 1898. 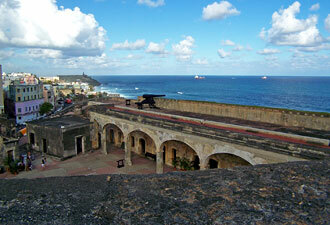 San Juan National Historic Site showcases the oldest European structures in the National Park System: El Morro, San Cristóbal, San Juan de la Cruz, the San Juan Gate, Paseo del Morro, and most of the historic city walls surrounding Old San Juan. Within El Morro, onetime battlegrounds are now a great place to enjoy a picnic, fly a kite, or just be dazzled by the historical scenes of El Morro and Old San Juan. Outside the fort, Paseo del Morro, a National Recreational Trail, introduces visitors to the seaside landscape that, along with the culture and history of San Juan, this urban park preserves. Visitors can enjoy stunning sunsets and cooling breeze from the Atlantic Ocean by passing through the San Juan Gate arch and following the trail for a stroll of 1.5 miles alongside the city walls and the walls of El Morro. From the upper level and outworks of Castillo San Cristóbal, the largest Spanish fortification in the New World, visitors can take in a panoramic view of the Old San Juan islet, as well as magnificent Atlantic Ocean vistas. The city itself, with its historic buildings, quaint houses, museums, churches, and plazas, is part of the San Juan Historic Zone. In San Cristóbal, a popular spot for visitors is the long, dark tunnel system that leads from the main plaza into a main dungeon where Spanish authorities jailed soldiers and others. Today, rangers tell the stories of prisoners. Lights are turned off, and visitors are left to experience, for a few seconds, the darkness and mystery of the place. San Cristóbal also boasts the “Devil's Sentry Box” — from which, legend has it, a Spanish guard mysteriously disappeared during his night shift — and exhibits many historic artifacts. These include an Ordoñez seacoast iron cannon fired during the Spanish-American War. One of the largest cannons in the National Park Service's cultural resources collection, this piece of artillery is one of a very few of its kind left in the world. 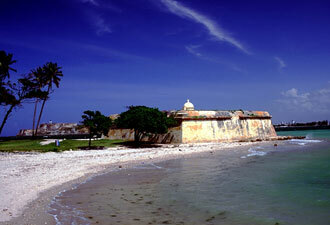 San Juan National Historic Site became part of the national park system in 1949 and was made a World Heritage Site in 1983. The park runs a free tram that connects its two fortifications, which are one-half of a mile apart. If you're looking for a place where summer is year-round; where history, artifacts, ocean vistas, and legends abound; where Puerto Rican heritage is preserved and shared with over 1.3 million visitors a year, come and visit San Juan National Historic Site. We can't wait to wish you Bienvenidos.